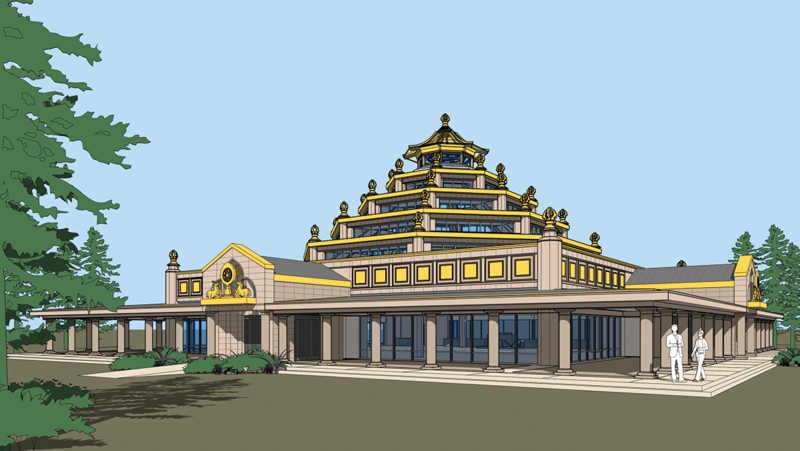 Within the beautiful, peaceful environment of IKRC Grand Canyon a magnificent Kadampa World Peace Temple is under construction - only the fifth traditional Kadampa Temple in the world. Based on the mandala and celestial mansion of Compassion Buddha Heruka, it will have five levels, four doorways, ornaments and archways. The special architectural design, as well as the sacred art on the inside and outside of the building, including the blessed statues and holy images, all reveal the Temple is a representation of the Pure Land of Buddha Heruka and Vajrayogini. The Temple is scheduled for completion in 2019, and the Festival will be preceded by a special ceremony to bless and open the new Temple. The ceremony begins with a ribbon cutting at the door symbolising cutting our ignorance of self grasping and self cherishing and entering into the path to the Pure Land of Buddha, represented by the Temple itself. We then engage in special ritual prayers and invite all the holy beings to enter and remain in the Temple to bless everyone who visits it in this and future generations. Watch the videos to follow the stages of the Temple's construction and adornment. A Temple is a meaningful object. Just seeing it brings great meaning to our life - and in life after life, I promise. A Temple is symbolic of the attainment of enlightenment, so it always reminds us to apply effort to attain the supreme happiness of enlightenment, the ultimate goal of human life.